Theta is a Greek letter θ which originally meant spirit or thought. We like to consider that it means Creative Spirit, as everything we do (and everything you do) is creative in some sphere. What's wrong with your phone number? As you can imagine, we hear this quite often since the way we list our number, 818-9-555-888, looks like something from another planet. However, when we landed this number in 1988, it sort of hyphenated itself. In fact, we’ve had clients call us who misplaced our contact information but remembered our phone number, just because of the unique layout. So, we’ve kept it like that on all our promotional materials and our website. Why should I hire Theta Media Group to design our website? Good question! We’ve been creating audio, video and print media for clients long before the Internet. When the Web gained traction, it became another endpoint for creating media. For us, it wasn’t difficult to learn, master, and then consult others on the technology. Most of our clients then hired us to build their websites, using the branding and content we had previously created for them, along with new content appropriate for the medium. Check out our Services and Client Showcase pages for more information. Who creates the content for our website? The content on your website comes primarily from two sources: your company and ours. The more quality content comes from your organization, the more cost-effective the investment in your website. Theta Media Group is capable of creating all of the content for any website, including Branding, Unique Value Proposition, Headlines, Body Copy, Blog Articles, Interviews, Data Tables, Photographs, Drawings, Video and Audio. We can also create the content for e-mail Promotion and Marketing campaigns. The more content we create, the more the investment on your part. We’re happy to provide what’s needed from both sides and will work with you to establish the optimum balance. Responsive is a term that applies to websites that are designed to intelligently rearrange themselves to best display on desktops, laptops, tablets and mobile devices. This is also referred to as “mobile-friendly.” Google has a mobile-friendly analysis page you can use to test your website to see if it passes or fails. Responsive is more than just aesthetics and functionality, it also affects website rankings. If your site is not mobile friendly, it will be ranked below every other website that IS mobile friendly, regardless of how optimized it is for search engines. All websites designed by Theta Media Group are responsive and pass Google’s mobile-friendly test with flying colors! The creation of a new website (or upgrade of an existing online presence) requires a comprehensive creative and technical skill-set. There are thousands of man-hours of experience that enable us to use that skill-set effectively and efficiently to design and build engaging websites. That said, just like a physical presence for your brand, your online presence requires an investment sufficient to rise above the noise and establish your own niche in the Internet space. During the Discovery phase of our research, we arrange all of the factors that present themselves in such a way that we can then write an accurate proposal, including all costs as well as a detailed timeline for management of the project. The investment in a website will also be affected by its purpose, content, scalability, and e-commerce capability. Our goal is to be able to work with the budget that is communicated to us as being allocated for the creation of your website. This is also covered during the Discovery phase of the project. Will my website work on all browsers? At Theta Media Group, we design websites to work in the most popular browsers (Internet Explorer, Chrome, Firefox, Safari) on desktop computers, laptop/notebook computers, tablets of varying sizes, and smartphones. We test our sites on many of these platforms to ensure compatibility. If you or your company use a specific browser or device that’s not in our testing suite, we will make sure your site gets tested under those conditions. Can you train us to update the website ourselves? Absolutely! 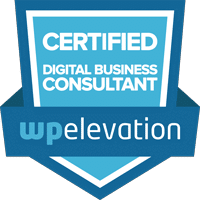 Training is one of the services we provide for helping clients update their content. Creating blog posts, adding images, adding/updating products are well within the scope of what can be learned in a few hours of one-on-one training. Note that more complex requests such as adding pages, changing the menu structure, etc., would require more skills than can be economically taught, which is why we offer project add-on services after the website is completed. 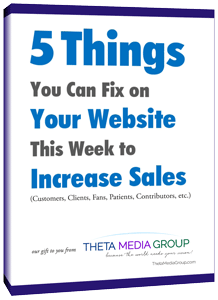 5 Things You Can Fix on Your Website This Week to Increase Sales (Customers, Clients, Fans, Patients, Contributors, etc.) Want your website to work harder for you? Learn about 5 things you can fix in the next week to attract qualified visitors and turn them into loyal customers. Randall Michael Tobin is an award-winning media producer, digital business consultant and website designer / developer based in Los Angeles, California. 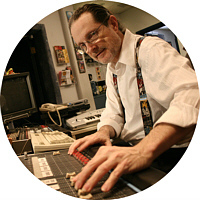 Since Theta Media Group's beginnings in 1977, Randall has been helping clients around the world realize their vision.